Brain-dead Hillary Clinton should be ashamed of herself. Her campaign re-emergence has James Brown rolling over in his grave. The Godfather of Soul would most definitely disapprove of a woman as sick as Hillary Clinton using his song, “I Feel Good,” as the intro to resurgence back on the campaign trail. Though the campaign did their best, Hillary Clinton still looked like death eating a cracker. Stiff as ever, and still donning “tents” disguised as clothing, Clinton trudged up the mountain of three steps to wave to the crowd. Her adoring fans were impressed that the nearly 70-year old walked without the aid of two very strong, heavily armed Secret Service people. Now we are to believe Clinton is the picture of health? We were told Clinton was dehydrated, when she “noodled” and almost fell flat on her face. Apparently nobody had a bottle of water? After going to Chelsea’s $12.5 million Manhattan apartment for the “dead broke,” Clinton was given a relatively clean bill of health. We learned later that Clinton had pneumonia. Wait, non-communicable bacterial pneumonia! Whew…that was close. James Brown actually died of pneumonia. 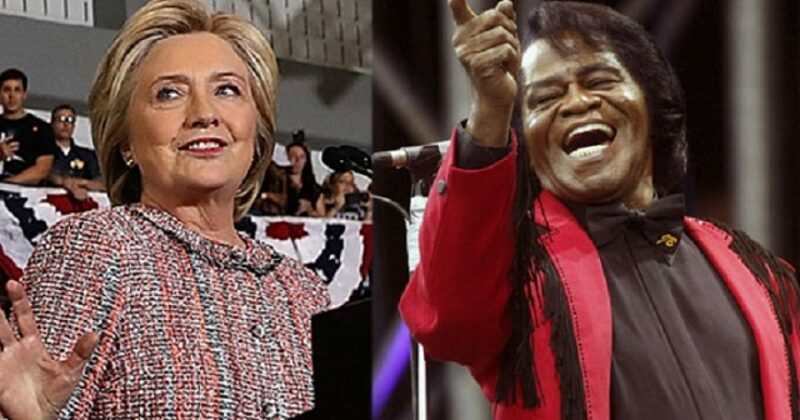 I hope the James Brown estate sues Hillary Clinton for gross malpractice, or whatever.